The Fritz Mann Werkseugfabrik Company was organized in 1923 but its origin dates back to 1896 when the company later known as Firma Fritz Mann Feinmaschinen- und Waffenfabrik (Fritz Mann Fine Machines and Weapons Factory) was operated by a family of inventors with a small factory in Suhl. Brothers Fritz and Otto and a son of Fritz, Willi, worked together on a wide variety of manufactured goods such as small engines, saws, ski-bindings, and safety helmets. Around 1919 they became interested in manufacturing pistols and created a very unique 6.35 mm pistol design. 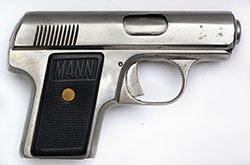 After selling it for a few years, production on that pistol ended and the company was reorganized as the Fritz Mann Werkseugfabrik, focusing their offerings on more conventional and larger caliber pistols. Eventually attention shifted completely away from firearms and the company closed in 1938. 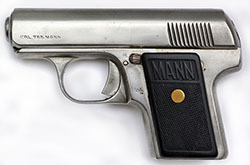 Fritz Mann designed another pistol after his unusual 6.35 mm design went out of production. The new pistol, in 7.65 mm and 9 mm, was more conventional in appearance but still had some innovative features. The pistols are some of the smallest ever made in their respective calibers, and were striker fired. The design is simple, with only 24 parts and no screws. Like his first design, Mann used an annular groove cut into the barrel chamber that allows the cartridge to swell slightly and dampen recoil. This was a key to keeping the pistol small. A slide nearly half the weight of the pistol, and a stout recoil spring, completes the recoil design. The fixed barrel mounts in the frame via a helical screw, which helps with accuracy. A loaded cartridge indicator is located on the slide; a small spring-loaded transverse pin extrudes when a cartridge is chambered and also serves as the extractor. Interestingly, the ejection port has a spring-compressed cover over it. When the slide is pulled back the ejection cover is held in its forward position, so that the chamber opens and the spent casing is ejected. This mechanism appears to be easily broken, as at least 7 of the 30 pistols reported are either missing it or have a broken cover. Production started in the fall of 1923 and lasted only two or three years. Serial numbers for the earlier 6.35mm model went up to 26xxx. The 7 .65 mm and 9mm serials are observed from 401xx to nearly 53000. Numbers were marked on the front grip strap. Based on observed serials, the total for both calibers couldn’t be much higher than 13,000, with the 9 mm being much more scarce, as they make up less than 7% of the pistols I have observed. German retailer Gustav Genshow (GECO) sold these pistols in both 7.65 mm and 9 mm for a few years. They were listed in Pricelist #33a and in Catalog #35, both dating to around 1924. No spare parts were offered but extra 7.65 mm magazines were available in the early 1930’s catalogs. 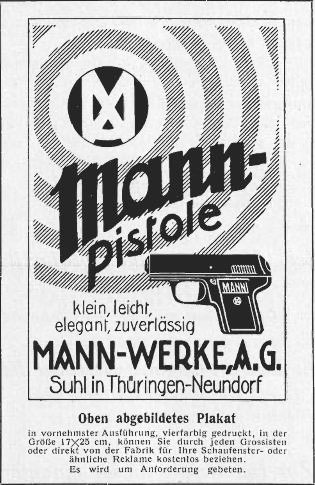 A large advertisement for the 7.65mm and 9mm Mann Pistol, with a brief article, appeared in the German Gun Industry magazine Der Waffenschmied on 25 March, 1925. The article described the gun and design in detail and offered any reader who wrote to the company a free four- color poster. Ads like the one below appeared throughout 1924 and 1925 but were gone by 1926. 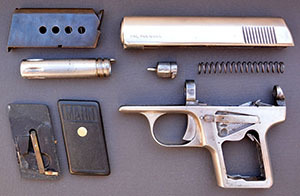 The little pistol pictured here is an example of the 7.65 mm model. It is “in the white,” as the original finish was removed a few years ago. Slight traces of bluing are visible on the sight groove and vertical serrations as well as the internal sections of the slide and frame. The slide is stamped “CAL. 7.65 MANN” and there is a very small “T” near the slide serrations on the left side. The rear of the slide has 11 vertical serrations on each side. The loaded chamber indicator pin, observed on every other pistol, is missing from this one. .380 ACP. It too has a bare metal finish. How it became mismatched is a mystery. The grip medallions on this pistol are worn smooth. Only the faintest trace of the” M and W” logo can be seen on one side. Both grips are stamped with “947” but the “4” looks more like a Christmas tree than a “4.” Each grip plate also has small pieces of wood glued to it, acting as shims to keep the grips tight. The shims look very old. This little Mann was brought back to the United States in December of 1945 by Technician 4th Grade (T/4) Mack B. Stone. He was originally from the St. Louis, MO area and served in the 308th Field Artillery as part of the 78th Infantry, Lightning Division, which saw action in the European Theater, particularly later in the war during the drive into Germany, in places like the Siegfried Line, the Roer and Rhine Rivers, the Cologne plain, the bridge at Remagen, and the Ruhr pocket. After the surrender of Germany, the unit was stationed in Czechoslovakia. Stone doesn’t remember the exact details of how he acquired the pistol but he stated that he found it somewhere on the ground; it was not taken off a combatant. Stone carried an M -1 Carbine and only shot it in anger a few times. This pistol he kept in his footlocker for a souvenir; he never carried it in combat. T/4 Stone’s bring-back certificate and a tag accompanied the pistol, as did a little brown holster. The certificate is signed by his Battery Commander, Captain Tester. The holster is a simple and small leather one with a large half flap that secures via a stud on the flap and a small body-mounted strap. There is a wide belt loop in the back and no markings are found on the holster. Before it was captured by Stone the stud was removed or lost and a buckle type strap was added. It was recently converted back to the original configuration. The two different caliber magazines for the Mann are very much alike. The only difference I can note between the two, aside from the stamp on the base plate, must be the spring. The .380 magazine will hold five rounds of .380 or .32, but the 7.65 marked magazine will only hold either four .380 rounds or five .32 rounds. Considering how the 9mm short magazine (.380) freely interchanges with the 7.65mm frame, it is very likely that the only differences between the two calibers of the Mann pistols are the magazine and barrel. The Mann pistol is a very solid and well-built little firearm; the high quality of manufacture is apparent when you hold it. The simple but large striker and recoil springs make it a very reliable pistol. The safety lever, which also acts as a magazine safety and breakdown lever, is ingenious but never caught on with other designers. That may be due to the one flaw I see in the pistol. In order to insert the magazine, either the lever must be held down before the magazine will fully insert and lock into place or the slide must be locked back and released after the mag is inserted. Other than that, it is a neat little pistol and a great addition to my collection. Thanks goes to my friend Tom Knox for parting with it and sending it my way. Remove magazine by placing safety lever to the magazine position. Pull slide back while holding safety lever down to lock slide back. Rotate barrel two full turns counter-clockwise. Pull slide back to release lock then push it forward. Lift the muzzle end up off frame. Thanks to Stefan Klein for information from der Waffenschmied.